I’m sure that by now you are all familiar with the dangers surrounding lead-based paint, especially for families with small children. 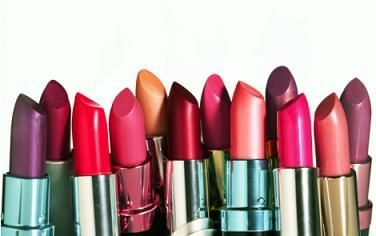 But did you know that some very unexpected household items, like your favorite lipstick, are also likely to have measurable amounts of lead, as well as other harmful metal contaminants? The F.D.A. ensures that most lipsticks, on average, contain only 1 parts per million (ppm) of lead, which “poses no real or unusual health risks”. However, to prevent childhood lead exposure, the F.D.A. sets a 0.1 ppm safety standard level for lead in candy. That’s 10-fold lower than for lipsticks. Besides lead, traces of cadmium, cobalt, aluminum, titanium, manganese, chromium, copper and nickel were also found in a recent study published in the Journal of Environmental Health Perspectives. In this same study, girls reported to apply these specific lipsticks up to 24 times a day. Does color affect the metal load? In a recent study done by the F.D.A. in 2011, it was reported that the highest levels of lead are found in deeper pinks and browns, while more neutral lip balms have somewhat lower lead concentrations (ranging from 8.9 ppm in dark colors to 0.37 ppm in lighter colors). In addition, more glittery lip glosses often contain mica, a naturally occurring mineral that is likely to contain lead, manganese and other metals. However, it’s important to remember that some metals can be absorbed into the skin and that a certain amount of lipstick is likely to be swallowed throughout the day and kissed away on a loved one’s cheek. You do the math…what are you comfortable wearing? 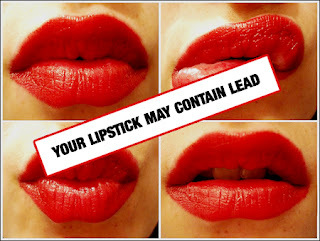 Did you know prior to this post that traces of lead are found in your lipstick? Do you think that the F.D.A. should place stricter restrictions regarding lead and other metal contaminants in cosmetic products? Would your willingness to buy a specific shade of lipstick change if the amount of lead was placed on the label? Are you less likely to let your child play dress-up with lipstick after reading this article? Next Post Pumpkin brownies, a new workout snack?